International Drone Day. All are welcome to come, connect, and learn about the exciting possibilities that unmanned systems can offer. This… is also Pi Day (3/14/15) and Einstein’s Birthday! 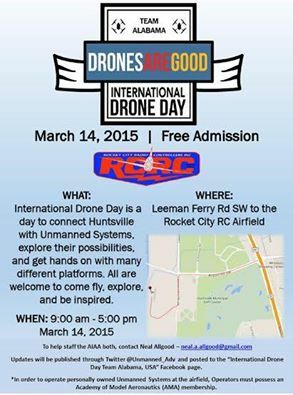 The Greater Huntsville Section will be manning a display & recruiting table during the event.